Gouvernemens Generaux de la Marche, du Limosin, et de l'Auvergne. 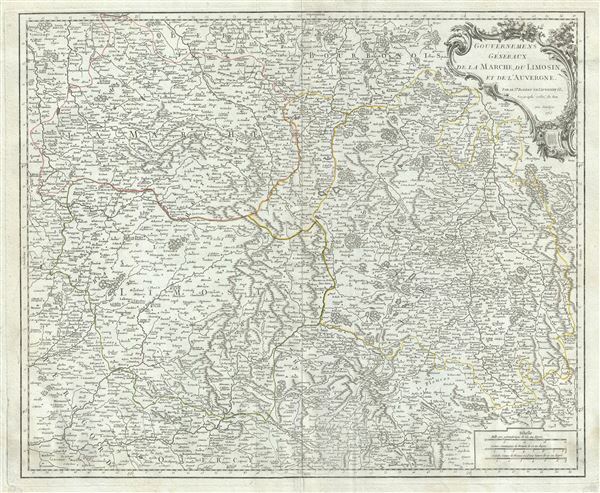 This is a fine 1753 map of the Limousin, Marche and Auvergne regions of France by Robert de Vaugondy. It depicts from La Chatre south to Domme and from Perigueux east as far as Le Puy, covering the whole or parts of the departments of Haute-Vienne, Indre, Creuse, Puy-de-Dome, Cantal, Correze, Dordogne and Lot. The map renders the entire region in extraordinary detail offering both topographical and political information with forests and mountains beautifully rendered in profile. The Creuse region is well known for its apple cider made from Limousin apples and its internationally renowned Limousine beef. Haute-Vienne is home to the commune of Limoge, which makes oak barrels used in the production of Cognac. This area is also quite famous for its porcelain (Limoge Porcelain) which they have making since the 1700Â's. Puy De Dome is a mountainous department which is part of Auvergne, one of the leading cheese regions in France. Here you can find a wide variety of cheeses including a number of Bleu Cheeses and local specialties such as Savaron and Bleu de Laqueille. The region is also known for its spectacular volcanic rock formations. Cantal is known for its production of Cantal, a firm cheese, named after the region. Correze is known for its production of Straw Wine, a sweet red or white wine, while Dordogne is famous for its production of Monbazillac, a sweet white wine, and Cabecou, a soft goat cheese. The map includes a beautifully engraved title cartouche in the top left quadrant. This map was drawn by Robert de Vaugondy in 1753 and published in the 1757 issue of his Atlas Universal. Rumsey 3353.036. Pedley, Mary Sponberg Belle et Utile: The Work of the Robert de Vaugondy Family of Mapmakers, 137.